Originally thought to be one of John White’s drawings from his 16th-century Virginia expedition, this colourful miniature is now attributed to the French artist Jacques Le Moyne. It does not show a North American native as first thought but rather imagines an early inhabitant of the British Isles, a member of the Picts, a group of people who lived in what is now modern-day Scotland during the Late Iron Age and Early Medieval periods. As Lisa Ford from the Yale Center for British Art notes, the image was most likely “intended to remind readers that early natives of the British Isles existed in a savage state similar to natives in the Americas”. Although the Picts are often said to have tattooed themselves, there is little actual evidence for this, though their name does seem to stem from the Latin word Picti meaning “painted or tattooed people”. 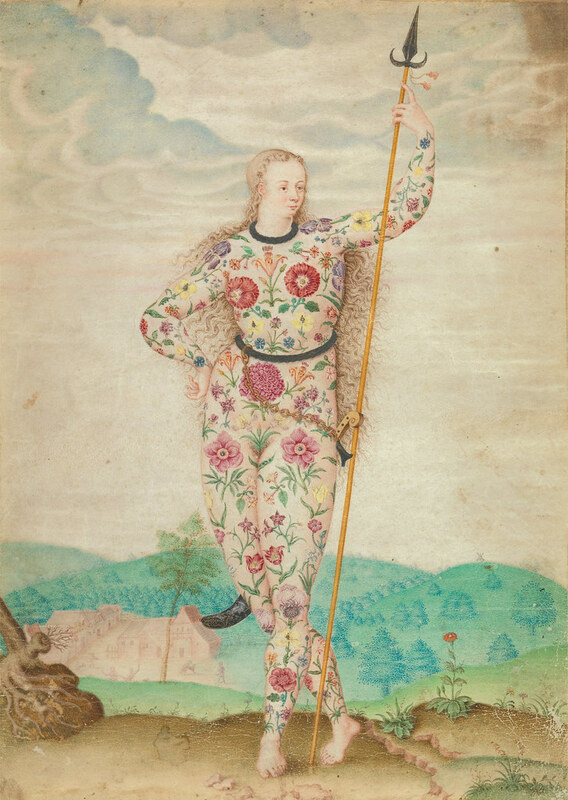 As Ford comments, Le Moyne’s rendering of this young woman in a head-to-toe floral tattoo brings together his “two known subject areas, ethnological drawings and botanicals”. Anyone clued up on their history of botany will notice that Le Moyne includes in his floral design species which were newly introduced to Western Europe at the time, and so rendering the woman in the picture slightly anachronistic.